Schmidt explained that enterprise customers can now be empowered with simpler solutions and don’t have to access a complicated system, but thing are turnkey. “We went through a phase that is basic connectivity, then we have a connection and publishing phase (early parts of the web), and now we have a connecting phase,” explains Schmidt. The superstars are these creative computer scientists that can get people together and work to build products. He said that businesses are much better off working faster, “just run faster.” And he says there are collaborative tools to help that. 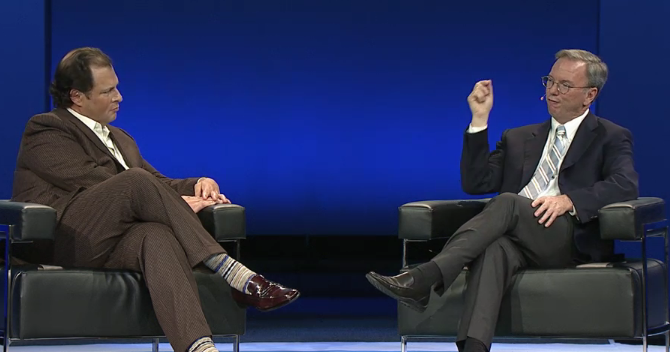 Benioff said that Google has cleaned Microsoft’s clock and asked Schmidt how he feels about that. “It’s hard for incumbents to move to new, faster model,” he explains. In Microsoft’s case, the company couldn’t innovate fast enough. “And we had the best data centers at the time, so we were able to get the best talent,” Schmidt explains. He also plugged Google’s productivity suite, Google Apps, which he says has 40 million users, and 5,000 firms are joining per day. Android has 550,000 phones activated per day, a number that doubled in four months, says Schmidt. There’s a hunger for a multi platform, multi-vendor highly competitive mobile platform, he says. And that’s Android.